Mai Couture’s new paper make-up is the latest beauty trend you need to know about. Did you know, you can now buy make-up made of paper? Introducing a range of foundation, highlighter and blush papiers, innovative beauty brand Mai Couture have found a simpler and revolutionary way to apply your make-up! Forget fussing over blending with your brushes, these light-weight pigmented papers are all about super smooth, convenient coverage and contouring. They are also talc and paraben-free, making them ideal for all skin tones. What we love most is the sophisticated, handbag-sized notebook in which the papiers are contained. They can easily be slotted into zip pockets or even your phone case. As for application, applying make-up has never been simpler! All you need to do is tear a sheet from the booklet – there’s 50 papiers in each – and press it gently against your skin before rubbing the coloured side in a semi-circular motion. For enhanced depth of colour, repeat this step with added pressure. 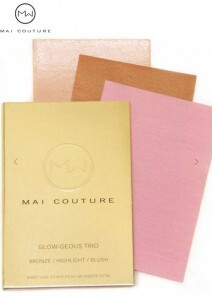 Another benefit of Mai Couture’s papiers is that they soak up any oil and dirt, which can leave your skin tone looking uneven throughout the day. Phillips advises on making sure you choose the right colours – especially for your base – to provide the best results. If you’d like to try Mai Couture’s paper make-up, you can find a range of products, accessories and gift sets available here. Would you like to find out more on how to improve your make-up techniques? Check out our Back to Basics blog roll.